Every first Sunday from March through November, local community members file through the historic house at Barclay Farmstead. The farmhouse has served as a historical museum for more than 40 years, giving local residents a glimpse at what life was like in the early 1800s. This year, the farmstead is celebrating its 200th anniversary with special events at the museum and other locations in Cherry Hill. For a time in the 1970s, however, the farmstead’s future was in doubt. The farmhouse was in disrepair and developers were interested in purchasing the property and tearing down the historic structure. A former Barclay Farms resident, Bonnie Cocchiaraley, was instrumental in saving it, helping to facilitate the purchase of Barclay Farmstead in 1974. She served as the farmstead museum’s original director for 17 years and helped launch an array of programs, many of which still exist today. In the same year the farmstead celebrates its 200th anniversary, Friends of Barclay Farmstead plans to honor Cocchiaraley. At Friends’ spring luncheon and meeting on April 14, Cocchiaraley will be presented with a plaque in honor of her service. It has been 25 years since Cocchiaraley, 92, left her position as director of the Barclay Farmstead Museum. However, she still remembers her time working there vividly. Cocchiaraley moved to Cherry Hill with her family in 1962. The family lived on Wayland Road, about a mile from Barclay Farmstead. Cocchiaraley loved history. She was a member of the Camden County Historical Society and helped get an old, Revolutionary War-era bridge on her property listed in the National Register of Historic Sites. The bridge was named Bonnie’s Bridge in honor of Cocchiaraley. It wasn’t until 1974, however, when Cocchiaraley became heavily involved with Barclay Farmstead. Cocchiaraley thought the farmstead would be a great local museum for the United States Bicentennial because of its history. Joseph Thorn, a Quaker farmer, built the farmhouse in 1816. Four different families owned the property through its history. In 1974, Helen Barclay owned the farmstead. She had previously sold dozens of acres for development in what is now the Barclay Farms neighborhood in Cherry Hill, but still owned 32 acres of what consists of the farmstead today. According to Cocchiaraley, Barclay was excited when she heard about the plan to preserve the house. 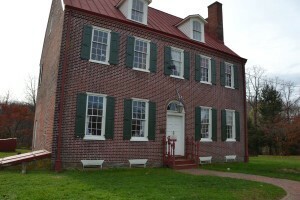 After Cocchiaraley and Barclay discussed the plan, Barclay visited town hall to meet with Holden to negotiate a sale of the farmstead. After the purchase, the township needed someone to get the museum off the ground. Cocchiaraley was hired as the museum’s director, a role she immediately embraced. She embraced it so much, she worked out of the farmhouse on a daily basis. Cocchiaraley’s office is located in what is now the first floor kitchen. The farmhouse was in disrepair when the township purchased it. After the purchase, the township paid for a couple major restoration projects, including putting on a new roof and replacing the plastering. However, more money was needed. Cocchiaraley quickly realized she needed help to get the house fixed and the museum running. Cocchiaraley had a hand in starting nearly all of the programs present at Barclay Farmstead today. Shortly after the township’s purchase of the property, Cocchiaraley knew she had to get other members of the community involved. She met with a Junior League, a group of women who volunteer to improve local communities. That group of women helped form Friends of Barclay Farmstead, a nonprofit group that helped raise funds and run programming at the farmstead. The group is instrumental in keeping the museum running today. Cocchiaraley also got additional volunteers thanks to a large amount of media coverage. Newspapers and television stations from around the area wanted to hear about the transformation of the farmstead. As the house was being restored, Cocchiaraley realized programming was needed to attract community members to the museum. One of the first events was Holiday House, a tradition still held every November the weekend prior to Thanksgiving. “That Holiday House was my favorite memory, the very first one,” she added. Another program still existing today is the partnership with Cherry Hill schools. Cocchiaraley teamed with a local teacher to create a program where Cherry Hill students would visit the farmstead and learn how people lived in the early 1800s. Making the program even more authentic were the tour guides who dressed as people would in the 1800s. Cocchiaraley had previously worked in the fashion industry and designed the costumes for the guides. The museum also used to have an event for Halloween where volunteers would tell stories to kids who visited. To help with upkeep of the property, Cocchiaraley remembers having people who were sentenced to community service for minor crimes perform their service at the farmstead. Minor restoration projects were done through the program. To help fund the museum, Friends held numerous fundraisers. Cocchiaraley remembers having barbeques where community members could pay to enjoy home cooked food, with proceeds from the event going toward Friends. Friends continues to raise money today to pay for programming at the farmstead. Cocchiaraley continued as director until 1991. After she left the position, she admitted one person could not take on everything she did. “They had to hire two people to do my job,” Cocchiaraley said. Cocchiaraley moved to Florida in the late 1990s, where she lives today. She comes back to New Jersey regularly to visit her family. She also visits the farmstead, with her last trip to the historic site taking place in the summer of 2015. Cocchiaraley’s role in forming the museum is unknown to many. Cocchiaraley said she avoided becoming the face of the museum. Cocchiaraley will be in the spotlight on Thursday at Tavistock Country Club as she’ll be presented with a plaque that recognizes her role in the purchase and restoration of Barclay Farmstead. It will hang in the downstairs hallway of the farmhouse. Cocchiaraley was informed she would be honored last winter after receiving a call from a Friends member, Sally Callaghan, who said there was nothing in the farmhouse saying how Cocchiaraley helped save the property and served as its director. Friends wanted Cocchiaraley’s name to hang in the farmhouse for years to come. Cocchiaraley said many of the long-time Friends members still want her to return to New Jersey and get involved with the farmstead again. “They keep telling me to come back. The old timers keep telling me ‘Come back Bonnie, come back,’” Cocchiaraley laughed. Cocchiaraley doesn’t plan on coming back. However, she does want the farmstead to remain a vital part of Cherry Hill for many years. For this to happen, Cocchiaraley believes new community members should look into joining Friends and seeing how they can help. She feels building a stronger volunteer base will only help the farmstead flourish.